. Roofing Material | Roofing Companies in Houston Texas | Anchor Roofing Inc.
Roofing Material How do I find what is the best choice? Great question, and unfortunately most people do not know more that their roofer, architect, builder, or what the Roofing Material suppliers representative tells them; however if you actually do a little research you can find out a lot of valuable information. One of the first things I look at when visiting a Roofing Material manufacturer’s website, or any website for that matter is: (a.) their Alexa Score (this can easily be displayed on any web browsers toolbar by going to www.alexa.com and downloading their toolbar) once you have downloaded the toolbar every website you go to will be shown via rank, where as the lower the score the better. Google is number 1 and Face Book is number 2 and any site that is globally over 25,000,000 will typically show up as “No Rank”. The highest rated Roofing Material Manufacturer’s Website that I know of is GAF’s website, coming in around 100,000 globally which is quite a feat, meaning that they have an average of 2,000 + visitors a day. After you have installed the, “Alexa” toolbar and you click on the icon it will show you information on the company. I recommend clicking on the “Search Analytics” button as it will let you know where their traffic is coming from, as well as provide a link to link to www.ispionage.com another free online metrics service that displays Google Page Rank, Organic SEO Value, SEO Keywords, PPC Budget if applicable, and a list of first page keywords as well as a list of Competitors and where they place in relation to their competitors. If the site has what is called “No Rank”, then you will have to manually have to go towww.ispionage.com . Another great site that provides both free information and Paid information iswww.spyfu.com and if you enter any website into the search bar towards the upper middle of the page it will show how many visitors are going to the site per day, as well as what the percentage of Organic verse Pay Per Click. How does all this help you determine, “What Roofing Material is a good choice”, online metrics do not lie, nor does a manufacturer’s websites Alexa Score. They are all means by which to determine online credibility. 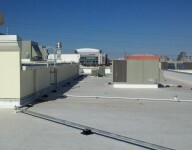 All the top Roofing Material Suppliers such as www.gaf.com , www.fiestonebpco.com and www.carlisle-syntec.com have great metrics as well as great Alexa Scores that illustrate they have a lot of original and unique indexed content, a high page rank, and a steady stream of Organic Traffic daily. Then there are some Roofing Material Manufacturers who know that there is no way they can Organically Compete with Roofing Material Companies such as www.gaf.com, www.carlisle-syntec.com and www.firestonebpco.com and they rely heavily on their Paid advertising campaigns to drive traffic to their websites where they tout their products as the best commonly; however often they only have a small percentage of the Roofing Materials market, but aggressive marketing programs. I view companies that must rely highly on PPC (Paid Per Click) advertising as less credible than the Roofing Materials companies that are Organically at the top, as Google has proven to be a reliable source of credibility, and if they give a Roofing Material Supplier top Organic Placement for whatever Roofing Materials you may be researching, for example: Single Ply Roofing Materials, or TPO Roofing Materials I always remember, just as my 73 year old non tech savvy mother does, “do not to click on the “Sponsored Adds”, as they have paid to be there and do not give us a true measure of credibility. When it comes to online credibility of anyone / or any company be it a Roofing Material Manufacturer, or even a local Roofing Company I have learned how to check metrics, site page rank which is a measure of the sites credibility, how much traffic they have had for some time, and what type of experience the user received. Did they go there and leave quickly, or did they stay and look around for a while, also known as “Bounce Rate”. One thing is for sure all the top Roofing Material Manufacturer’s have the combination of a good Alexa Score, a High Page Rank, and an established Organic Position on Page One of Google, and do not rely solely on a paid advertising campaign. When I see any site that that relies mostly on a Paid Advertising Campaign it is like sending me an alert, proceed with caution as this site did not earn their way to where they are, they paid their way to where they are, just as if they turn off their PPC campaign they will fall off the first page, where as trusted site of Roofing Material Suppliers will always remain at the top Organically. Also, there is the time proven fact that the Roofing Material is just a part of the equation, and you could have the best Roofing Materials available; however without adept well trained installers the roof system is only as good as the Installers who installed the roof. There is a saying, “The linger of great price is long forgotten before the linger of great service”. This holds true for Roofers and Roofing Material Manufacturer’s as well as their endorsed Roofing Material Suppliers. Another important thing for you to look for is that the Roofing Contractor, or Installer is a Certified applicator in the roofing system they are installing. This helps assure they have been properly trained and that any applicable product or system warranty will be valid. Most Roofing Material installers, Roofing Companies usually display their certifications somewhere on their website. If not then do not be afraid to ask and confirm this. It will save you much headache down the road. Another good thing to look for when researching Roofing Materials you may use, is first the Energy Star stamp of approval as it means that the product has been on the market for at least 3 years and has proven its performance. If you are looking for a Green, Environmentally friendly material any product that displays the USGBC stamp (United States Green Building Council) is highly recommended. In sum, research into the Roofing Materials you are thinking of using can prove to be well worth the time invested. Your roof be it your house or a Mall, is one of the most vital components of any building. Groups that test Roofing Materials, such as, ASTM (American Society of Testing Methods), UL (Underwriters Laboratory), FM Global (Factory Mutual), as well as the CRC (Cool Roof Council), and the USGBC are all considered 3rd party testing authorities, and their approvals are common part of any Architects Building Specifications, and have been leading 3rd party testing authorities for Roofing Materials, total systems, as well as installation protocol.